We know you love effects; we love them too! 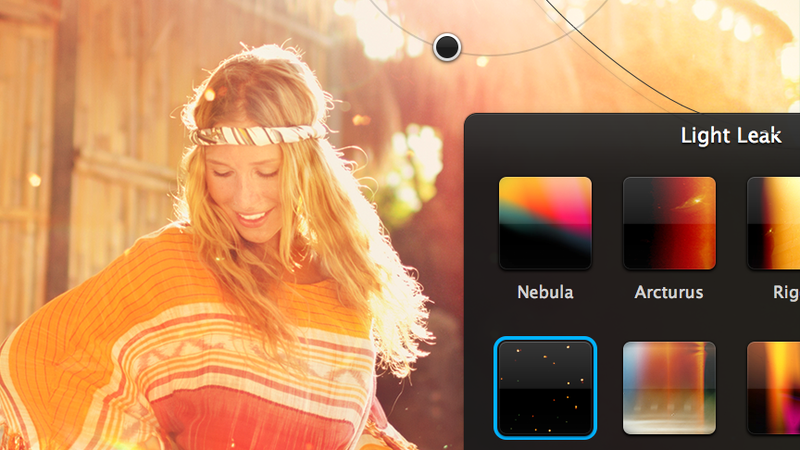 In Pixelmator 2.2 Blueberry, we are adding one more gorgeous effect called Light Leak to the collection. The effect is super easy to add and the outcome is a stunning, retro-artistically illuminated image. Enjoy! Effects browser!!! At least I hope there will be option to add effects from menu even I can’t see one on that video…yet! Light leaks sure looks nice, but please think little bit more about usability. I love it! Can’t wait for the release and layer styles, too. Keep up the good work. Oh yes, please add the old “Effects” menu, too. Lovin’ it! You are doing an awesome job with Pixelmator. Love the program. Keep up the great work!!!!! Very eager for this release. Wonder what release will bring the Layer Styles mentioned? I’m guessing it won’t be in Blueberry since the team mentioned they were bringing on Blueberry prior to it’s release if I read the earlier blog post correctly. I hope others didn’t miss that and think that feature will be in this release. Wann wird die neue Version veröffentlicht? Kann es kaum noch erwarten. Pixelmatorteam ihr habt eine klasse Software entwickelt und endlich ja endlich eine preiswerte Alternative zu Photoshop und Fireworks für den Normalanwender. Well that’s nice I guess. Feels like Pixelmator is going down the Instagram type route at the moment and spending time adding features of “secondary” importance. Let’s have Layer Styles and the ability to make a vecor path a selection. Oh, and like others have mentioned, can we have the effects back in the top menu. Still looking forward to this update though. The new features in 2.2 are looking good so far. Ughhh… Sometimes I wish I still had Pixelmator 1 installed. I really don’t understand the negativety of some replies. If you want Pixelmator to be the same as Photoshop, the go out and buy Photoshop. If you don’t like Instagram-like features in Pixelmator, don’t use them! Really looking forward to this release and even more to the one after that (layer styles!). I love it! Can you give us a rough timeframe for the release please? I’m really, really waiting for the new “Convert Text into Shape” feature. Thanks for all your work !!! What you’re doing now is more frustrating than it is exciting. Honestly, you guys need to work on building up your release with a planned series of promotions rather than your random updates. You need more content that leads up to the release of version 2.2. A blog post here and there… is extremely annoying. If you’re close to release, you need to set a date publicly. Otherwise quit creating hype. Or hire a new marketing director. You guys are being ridiculously annoying and disrespecting your customers. Not with a crappy product, but with crappy marketing. Release the freaking product or give a date as to when it’s coming out. Otherwise shut up and quit saying “coming soon”. Your sporadic updates are just frustrating people, not creating and keeping clients. It’s not just Photoshop wanna-be’s that are using this software anymore. Aim to please, in all aspects, not just in developing a great image editor (you do that well). On the flipside, pixelmator is great! Despite the annoying nature of your marketing failures, I’m really looking forward to the new features. Keep up the good development work! I would like a monthly minor release leading to a great software instead of a major release that is not listen to customer request. PXM is not Photoshop infact we ask you to listen to our request. It would be so much better if replies to these blog posts would be turned off. I have been using this product for a number of years now and i have loved the evolution and how it brings across aspects of other packages into what we have today and i am very satisfied with what i paid for! but some of your demands and expectations are just outrageous! Just remember how much you paid for the product! Don’t pay for a Ford and expect Ferrari service! and in no way is that a derogatory statement at all as i have used Pixelmator in some blue chip projects and the clients are none the wiser as the end result has been outstanding and i wouldn’t have got a better result using Photoshop and as i am a heavy user of the Photoshop CS brand due to certain tasks i carry out i do use Pixelmator as i find the workflow less demanding than it would be in Photoshop making it much more pleasurable to use! I can see some of these demands being acceptable if you are paying £1000+ for a package as is with the Photoshop brand as that level of income provides the resources where updates can be churned out more frequently but also don’t forget that once you have purchased Pixelmator all updates are free for life even major updates unlike! Personally myself i think a few of the comments on here are expecting way to much! I completely agree with you David. Finally someone said it and it should have been said a long time ago. Thank you. I’m a new user of Pixelmator and I like it. Of course it is frustrating to wait something you like! Me too I’m checking everyday for the update but please don’t be rude, your comments don’t help anybody. All my encouragement to Pixelmator’s team! one of the many things that I liked about Pixelmator is the way in which the tutorials are presented. Within just almost one minute you can discover a lot more about this graphic app. Thanks for those who worked hard to offer a low price product with high performance ! Of course this is simply my opinion but many of us have asked for more communication from the team and I think their blog posts are doing a pretty good job of that. If hearing about new features that the rest of are happy to hear about annoys you then perhaps the blog isn’t meant for you. The Pixelmator Team can’t win with everyone. Also how can they give an exact release date when they don’t know. Their aim I believe is to ship the product as bug free as possible and with all the features they had planned for a specific release. With a small team that sometimes gets pushed back because you find something’s are not playing well together or cause unforeseen issues. As long as they do their best to let us know when something is running longer then expected and maybe show off a few new features as they near completion I don’t see how that can get anyone up in arms. It will hit the MAS when it’s ready. Keep the blog posts coming until then is great by me. And by the way the complaint about waiting more time because they added a new filter… I doubt that took them much time and I am sure it will please many people. The fact that they are trying to put in a little something for those that will appreciate it is a good thing for many and probably a smart business move. Keep up the great work team. DON’T move the Effects section to the menu, please! I find the FX browser’s been one of the best “innovations” in Pixelmator and for me it’s annoying when I have to search the FX in the menu again and again. If you return to that, please give the ones who like it the option to activate it. I’m really – almost desperately 😉 – looking forward to being able to use it! Most of us can handle that better and faster than the current extra palette (= less screen estate). WebTread got my vote too! I quickly got used to the way the palette works (drag & drop and so on), for me it makes it easier and more effective. You can open and close it with a shortcut, so it doesn’t disturb me at all. You got the same quality from Pixelmator that you would have with Photoshop? Okay, I can understand being a fan. I can understand thinking highly of a product. 24bit color. The fact is it exists in Photoshop and it doesn’t in Pixelmator. That must have been some simple “blue chip” work. The point is it helps the team to know what features are requested by the largest number of users. The other solution is that people say nothing. Then they keep looking for something that does what they need knowing that Pixelmator is an almost. Pixelmator looses share to other projects and eventually has not enough people paying for it. Then it dies off. The team is a group of hard workers. They do their best to herd cats. I agree with how good the product is. I’m afraid of some of the changes people are requesting (changing the UI colors as an example). However, this tension is good for the team to see. That’s news. The Pixelmator team begs to differ (per their website). I bought Pixelmator at version 2. I’ll have to pay to upgrade at version 3. I have no problem with this. I WANT to continue to financially support their quality product. You may want to get your facts straight before attempting to chastise people. I’m looking forward to the next version. Not that i need any of the new features, but i’ve found that, in the end, every feature has its purpose. You learn by simply applying them. Sometimes it makes sense, sometimes it doesn’t. The package itself i find value for money (especially at the current temporary (or is it permanent?) special price). No problem when i have to pay for major upgrades. Do we have a release idea? People please… Stop asking for effects menu and filters already ! I will explain to you this in a very simple way. THE LESS IT LOOKS LIKE PHOTOSHOP THE BETTER. Pixelmator is not a Photoshop clone, is a Photo editor as good as Photoshop made by people who loved to use Photoshop but realized it was too expensive and it doesn’t was using Apple OS X graphic Core at all! This is the answer of a great app using great technology. Yes it was very similar at first but now it is more complete and is getting a unique look and workflow that took it apart from Photoshop. If you are seiously looking for Photoshop features on Pixelmator go buy Photoshop but if you are wiling to learn a new curve and a new way of creating arts buy Pixelmator and enjoy it! I love how all of this GUI enhancements and filet applying techniques are getting more and more useful with every update! I think your analogy is way off base. Many of us have been with Pixelmator for quite a long time and are frustrated at the slowness of the developers to add layer styles. It is easily the number 1 request from users since version 1. The reason that is is so frustrating is that most of they other photo editing app offer layer styles. (Acorn and nearly every other one for iPad). Its been 4 years now (nearly 5 years) and the greater user base is still clamoring for layer styles and we get Instagram effects instead. Nothing wrong with Instagram effects but do they make the app any better? not in my opinion. Don’t misunderstand frustration with a lack of enthusiasm for the product or the company, its just the opposite in fact. I think you guys need to add voting to comments, so that we can down vote the silly negative comments that don’t make sense, and make them disappear. Being constructive is one thing, but complaining about how to promote is just silly.I can’t believe people are complaining about how you guys are showing off the features. I appreciate your communication, and I look forward to any future information you provide. Keep up the hard work and don’t let the negativity get you guys down. I’m looking forward to the new features in Blueberry, but I would like to add another voice in favor of adding back the effects menu as an alternative way to apply effects in addition to the current effects palette. The palette is handy for browsing through and discovering new effects, but the menu was a faster, more streamlined way to add an effect when you already knew exactly what you wanted. @Jonathan B. try to add most usable effects to favorites in Effects palette, it’s much faster than searching. I’m very interested in Pixelmator even though I have not tried it yet. – Is it possible to use Photoshop filters (as it is in Aperture, Corel PhotoPaint etc.)? – Will it support 16Bit/Color in the near future? This is very important for me… 256 grayscales is a huge problem in 8bit/Color mode, even with dithering/noise-/blur- tricks. I find the voice of the tutorial lady extremely distracting. It’s like she is trying too hard to sound “cutesy” pronouncing words like they all start and end with “SSsssSS”. If you want to speak fast and clean, do fast and clean without the s’cutesy’sss. An example from above tut. Was that line distracting and annoying to read ? Then it is too listening to it. WOW! I really must say W O W!!! I am a user of photoshop for 15 years – but this light leak effekt is GORGEOUS!! Never saw something like this. So easy to use ans such a fantastic result! I like these light-leak-effects a lot! Especially the Orion-Effekt is something great – looks so good and realistic. Sure – you cannot match Pixelmator with Photoshop – but only because of the light leak effect I will buy this software. PLEASE PLEASE PLEASE make more different styles of the light leak effects!!!!!! Bokeh effects (lens flare) – to use like the light leak effects this would be the TOP of this product!!! That is really attention-grabbing, You are a very professional blogger.